Across the street from the Mahendra Prakash Hotel on Lake Palace Road is the Gulab Bagh, a 100 acre garden. There is a mile or more of wall separating it from the street, and many sections of this wall have been painted with murals. The quarter mile length of murals across from the hotel are the most beautiful. 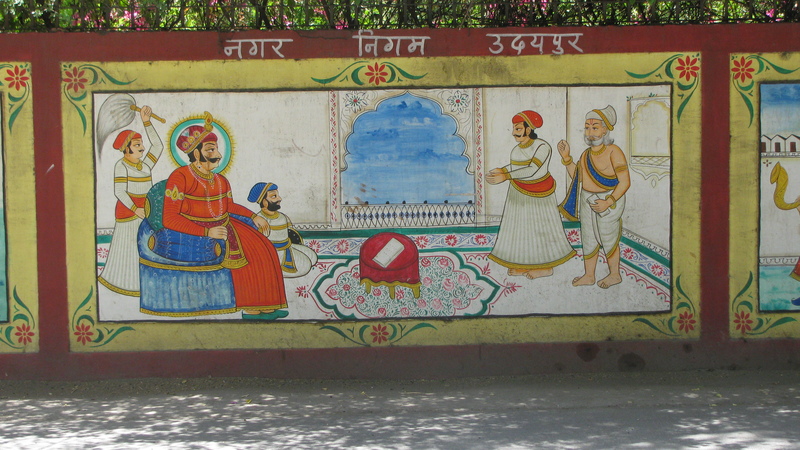 Udaipur is known as a place to buy miniature paintings. There are many art schools here. 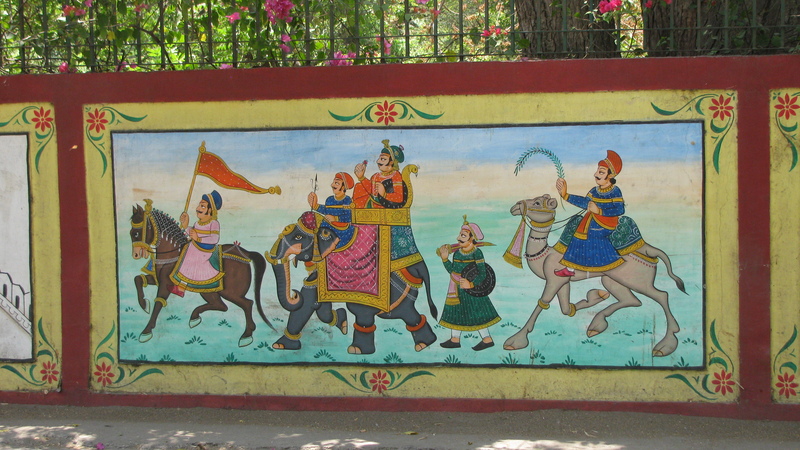 A guide told me that is why there are so many murals in Udaipur. It seems logical, but who really knows. 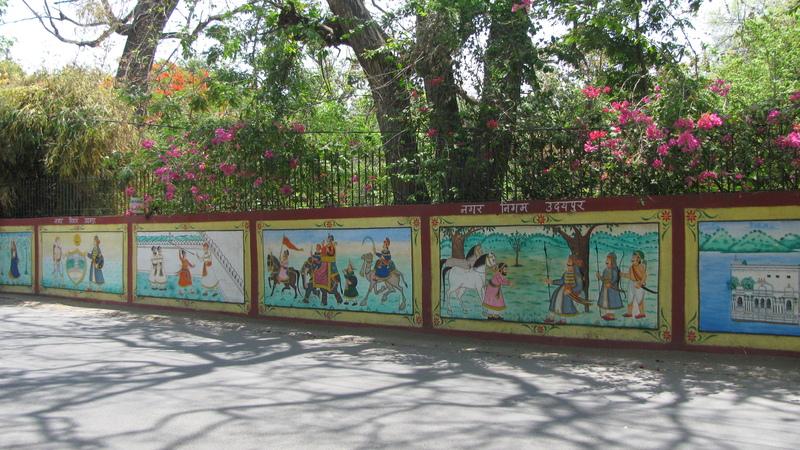 For more photos of the murals on Lake Palace Road, visit the Travels in India Facebook page. Nirmal’s son Mohit turned three on May 1, 2015, the day before I got here, but he waited until my arrival to have the party. We talked about the party at the Mewar Haveli Hotel restaurant while we waited for my room to be ready. He told Rafiq and I that he was planning a large get-together with maybe around 120 people. “Oh, no!” was our immediate simultaneous reaction. You have a big party, and you end up doing nothing but working to serve the guests. No time to enjoy yourself. Nirmal finally settled on around 20 relatives to invite. The party was to start at 7:00. Pushker came to the hotel to pick me up in an auto rickshaw at 6:45. We were the first ones there. Rafiq and wife Shahi came shortly after, and Madu, a good friend of Nirmal’s also showed up. I was really glad that the party had been scaled down. Most of Nirmal’s relatives don’t speak English, and I was exhausted after the 30 hours of travel to Udaipur from Washington, DC. I knew I wasn’t going to be an effervescent party guest. “They are coming,” he replied. They are not, I said inside my own head. “I should have told them six,” he agreed. It didn’t matter. They didn’t come. I gave Mohit a copy of The Cat in the Hat, the only gift I’d had time to wrap before Pushkar picked me up. A typical American three-year-old would have had the wrapping paper torn off in a split second. In fact, Mohit’s two-year-old cousin was happily reaching out to do that honor because Mohit seemed to be frozen in time and space. He didn’t want to open the present, but he didn’t really want his cousin to do it, either. It took about an hour for the unveiling to take place. But I had brought a copy of Horton Hatches the Egg the year before, and I was told that Mohit loved it. He did seem interested once he started paging through it and seeing the illustrations. They brought out the birthday cake about an hour later, sang the birthday song, and Mohit blew out the candles. Apparently it’s traditional to feed each other a bite of cake. 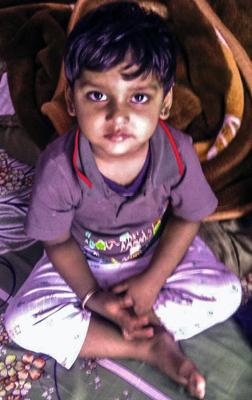 Mohit offered me a piece in his tiny hand after much coaxing by his parents. Even though he had seen me many times talking on Skype to his dad, he was very shy and didn’t want to approach me. I tried not to intimidate him by avoiding eye contact. Nirmal said it wasn’t just me, Mohit is shy around all strangers. I asked Rafiq when would the presents be opened. I learned that in India presents are not opened in front of the guests. I also noticed there didn’t seem to be any presents other than the ones Rafiq and I had brought. Snacks were brought for the guests. We ate and chatted. Nirmal’s stepmother noticed how tired I was. She asked if she could oil my hair and give me a head massage. She doesn’t speak English, so Rafiq interpreted. He said the head massage would lift the tiredness and give me energy. I never have to be convinced to get a massage, especially a free one, and happily consented. I was treated to the best head massage I’ve ever had. She used almond oil, which smelled wonderful. She worked on my head, neck and shoulders for about 20 minutes. And sure enough, a short while later I did feel less tired and more refreshed. It was getting late and time to go. Tradition or no tradition, I wanted to see Mohit’s reaction when he saw the stuffed toy horse I’d brought him. 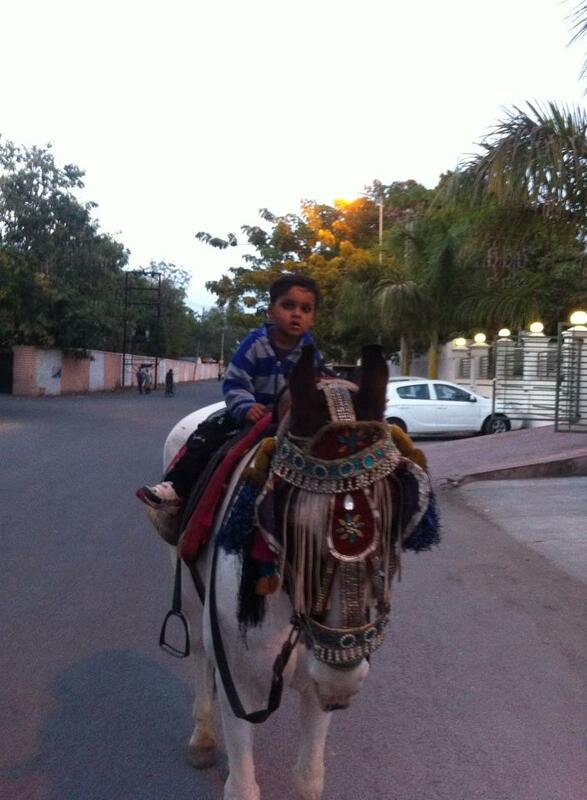 Nirmal had told me how much Mohit loves horses. I thought that maybe the toy horse might elicit a reaction other than the terrified frozen stare I’d seen most of the night. I took his gifts from my bag — the horse puzzle, the toy laptop and the little stuffed horse — and put them on the coffee table. I hadn’t had time to wrap any of them. The horse was in a clear plastic bag, and I had tied a gold ribbon around it. 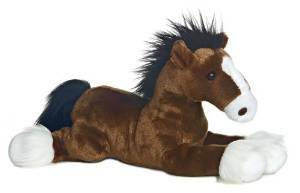 All of the adults cooed over the toy horse. The two-year-old cousin was excited and tried to help Mohit yank off the plastic bag, but Mohit refused. He didn’t seem to care much that the cousin grabbed the toy from him and began to play with it. Interesting, I thought. I bet all that will change once I leave. I returned to Nirmal’s home that evening so we could all go out to dinner. Mohit hid when he saw me, but I saw him playing with the toy laptop on the bed. I was glad he was having fun with his toys. Maybe next year he’ll come out of hiding when I visit. 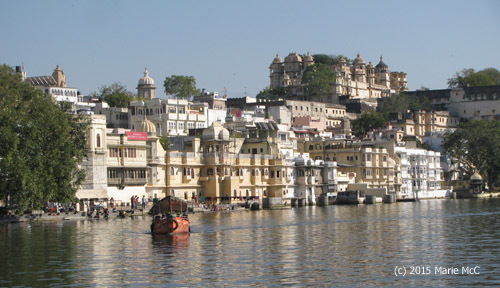 This entry was posted on May 16, 2015, in India, Indian culture, Udaipur. It’s been a year since my last post, and I’m getting ready to return to Udaipur for my fifth visit, like the swallows to Capistrano. It never fails to amaze me that I still have a list of things in Udaipur I haven’t seen yet. After four visits, I should have hit all the touristy highlights by now. But I still haven’t gone to Bagore ki Haveli or seen the dharohar dance performance. Haven’t been to Bharatiya Lok Kala folk art museum nor strolled the gardens of Saheliyon ki Bari. I haven’t seen the sunset from the Monsoon Palace. And I want to do all of these things. I have another list of Udaipur restaurants to try. Since Nirmal gave up management of the Island Tower guest house several months ago, I hope we’ll be getting out to more different places to eat since we won’t be having our meals there any more. Udaipur is a city of half a million, so there’ll always be new restaurants to try, but there are about a half dozen I’m really interested in, including Upre with its spectacular lake view. Nirmal and Rafiq are planning another road trip. 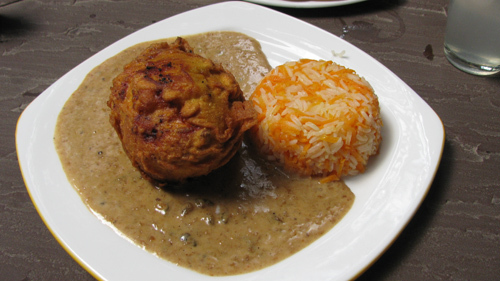 This time we’ll go to the state of Gujarat, which lies between the Arabian Sea to the west and Rajasthan to the east. Nirmal has mentioned we should visit Sasan Gir, a national park and the only place the endangered Asiatic lions can be seen. We’ll go on a jeep tour of the park. My new safari hat just arrived! The fun starts when I land in Udaipur on May 2.